Collectors of single handstamp overprints often ask me for a "nice, clear strike". Frequently, that is a difficult request. Handstamps applied to thousands of stamps, in a hurry, are generally not very clear. Or, at least, they are very variable. Only forgers come up with a perfect strike every time. It actually makes a lot more sense to collect single handstamps in small multiples, especially if they are inexpensive stamps to begin with. Tidying up my stock, I grouped together the examples of Podillia Xa shown above. 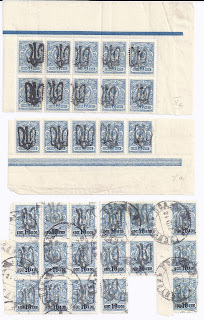 The mint 7 kopeck stamps are catalogued just 30 cents each in the Bulat catalogue (#1722 with $150 for used) and the 10/ 7 stamps are catalogued just $2.50 each for used (Bulat #1723; $8 for mint). The whole lot are worth 30 to 50 euros retail, depending a bit on what premium you put on multiples. For that modest price, you have a complete album page and a group of stamps which will help you decide whether or not other single stamps which come your way are examples of Xa or not. From the mint stamps, it's easy to see how the clerk doing the work overprinted from left to right and re-inked after five strikes. You can also get a sense of which parts of the handstamp always print and which parts sometimes don't - this was a wooden handstamp so it would not have been perfectly level and the clerk would have naturally held it at a bit of an angle. The mint stamps also help to confirm the used copies as examples of Xa even though they don't have one of the features of the Bulat illustration - a small spike protruding inside the bottom of the right hand wing. This is, in fact, only clear on a few of the strikes, notably the left hand stamps on the mint blocks. It is a feature which may have been affected by wear and tear to the handstamp.